Bro. Eli Soriano, together with the famed 1950s music ensemble, The World Famous Platters, turned the ADD Convention Center into a music hall filled with classic ballads and medleys for just one night. 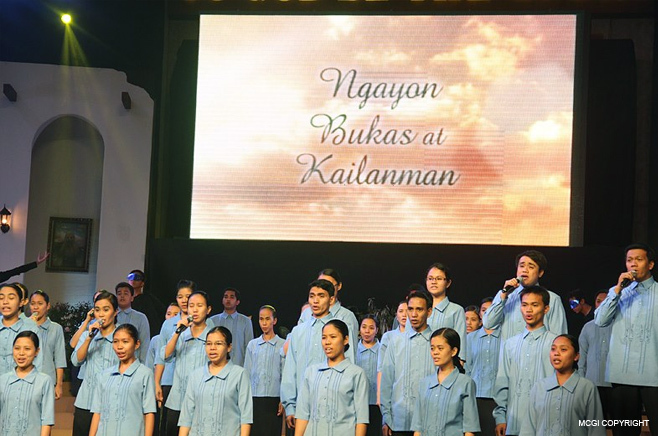 Dubbed “Remember When,” the benefit concert started at around 6 p.m. on March 31 this year, a day after MCGI’s three-day Thanksgiving of the Body. Bro. Eli Soriano and Bro. 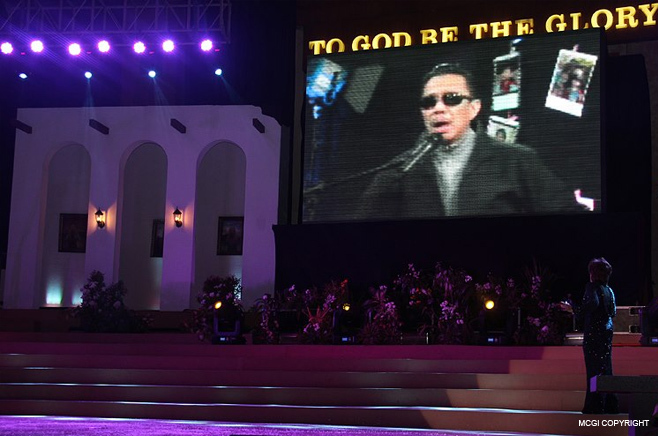 Daniel Razon made sure that the night’s concert would be marked with memorable performances from MCGI’s homegrown talents and local artists. On the ADD Convention Center stage in Pampanga, Philippines (from left), Mose Stovall, Yolanda Branch-Fletcher, Eddie ‘the Emperor of Soul’ Stovall, Lawrence ‘Rooster’ Lockard, and Jerrad Tilley. MCGI’s own pool of theater dance troupes opened the concert with their creative dance interpretations. 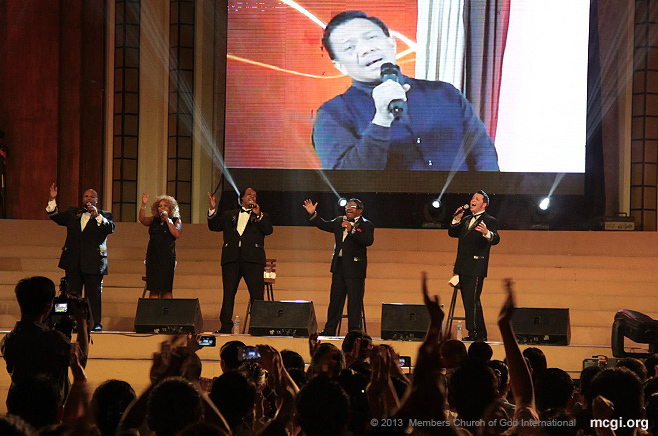 Performers who graced the evening’s first part included Frank Packing, ASOP TV song interpreter; Lilibeth Garcia, Karaoke World Championships runner up; Hammilan, band vocalist, and; MCGI’s Music Ministry. Filipino singer-composer Rey Valera was another highlight of the evening. 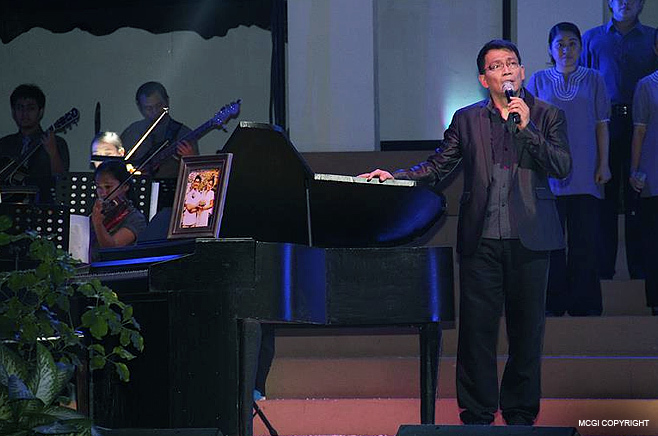 Valera sang some of his best-loved songs like “Kahit Maputi na ang Buhok Ko” before smoothly transitioning to the night’s special performances, including the duet between The Platters and Bro. Eli. 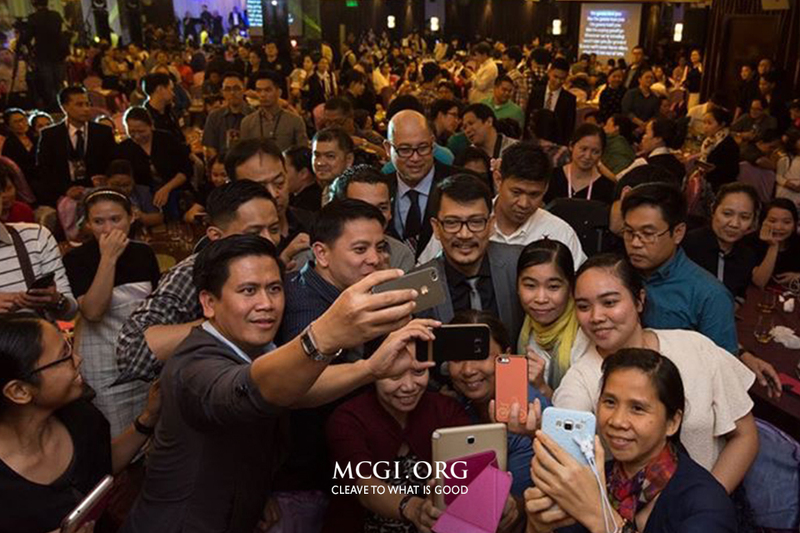 The Platters serenaded tens of thousands crowds at the convention hall and other MCGI coordinating centers all over the world via live video streaming with songs they popularized between the late ’50s and early ’60s. These performances included “Only You,” “Twilight Time,” “Remember When,” “Stand by Me,” “The Great Pretender,” and other Motown medleys. In between songs, The Platters shared trivia and fun facts about their group’s more than 50-year career-spanning accomplishments. Bro. Eliseo Soriano with the World Famous Platters singing “Smoke Gets In Your Eyes” via live video streaming. A special duet of “Smoke Gets In Your Eyes” by The Platters and Bro. Eli proved to be one of the crowd’s favorite parts of the night. “It’s the first time we’ve done anything like that, but it was really fun,” remarked Jerrad Tilley of the technology-aided performance. To cap off their gig, they thanked the audience and greeted Bro. Eli who celebrated his baptism anniversary on April 7. After the last song of The Platters, Bro. Daniel took to the stage and offered some covers of songs and teased on a new song, which is part of a new music album he is launching this year. MCGI’s Vice Presiding Minister also performed “Yesterday,” “Together Again,” and “What Kind of Fool Am I.” After a few songs, Bro. Daniel led the crowds in singing the Church birthday song to Bro. Eli. When it was Bro. Eli’s turn, the Presiding Minister to MCGI’s rendition of “And I Love You So” and “A Certain Smile” further heightened the entertainment and celebration. Bro. Eli afterwards thanked everyone who made the concert possible and shared words of wisdom from the Bible to the audience. Proceeds of the “Remember When” concert will be for the new Convention Center in Manila whose plans include a free hospital, college, and Transient Home for all. The song, “Walk with Faith in your Heart,” was performed by Bro. Eli as attendees left the convention hall. While majority have left already, Bro. Eli continued singing until the wee hours of the night (Philippine time) for those who were still monitoring the concert through live streaming and satellite facilities. 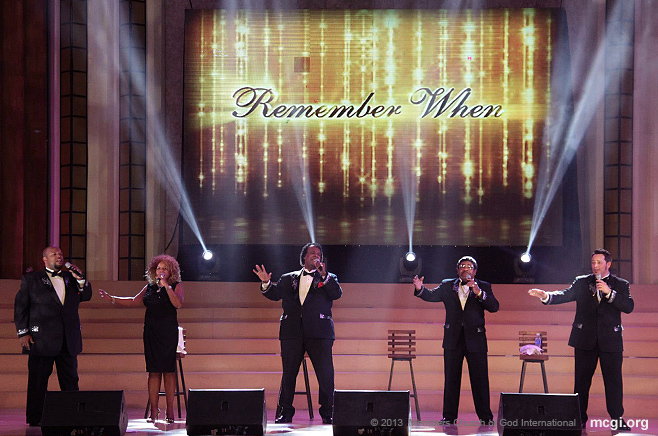 The “Remember When” concert was aimed at raising funds for a new convention center dedicated to families of MCGI and Jesus Christ’s One Thousand-Year Reign on earth. The concert was a week shy of Bro. Eli’s 49th year in service to God and the people on April 7. In all those years he served, Bro. Eli only missed one Church service due to severe illness. Although his main dedication is in preaching the Gospel worldwide, an international preacher known for his compassion for the poor once again marks that love with song. Bro. Eli Soriano has always been affectionate to the less fortunate of the society. This drove the Ang Dating Daan host to hold a major concert in the Philippines’ biggest entertainment dome, the Araneta Coliseum, on November 22, 2010. Bro. 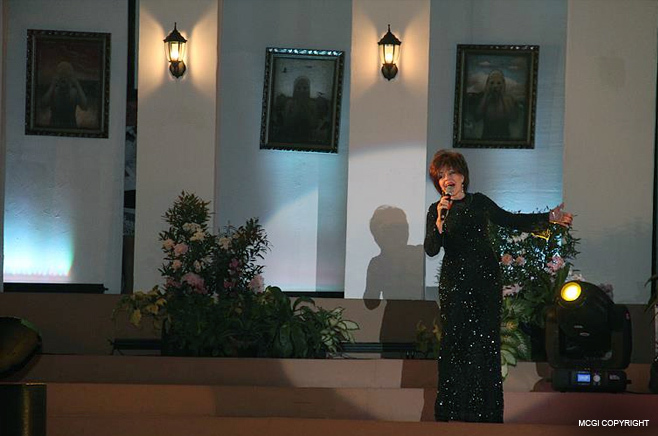 Eli Soriano sings Filipino classics with Asia’s Queen of Songs, Ms. Pilita Corales. “Songs from My Heart by Bro. Eli” is the title of the concert that aims to raise funds for the Free College Education program dedicated to the scholars of La Verdad Christian College in Caloocan City and in Pampanga. The unique scholarship program includes free tuition fee, free text books, free uniforms, free meals, and free dorm accommodation. This is to secure the education of the poor but deserving students. According to the preacher, poverty should not deter the development of future leaders for the country. 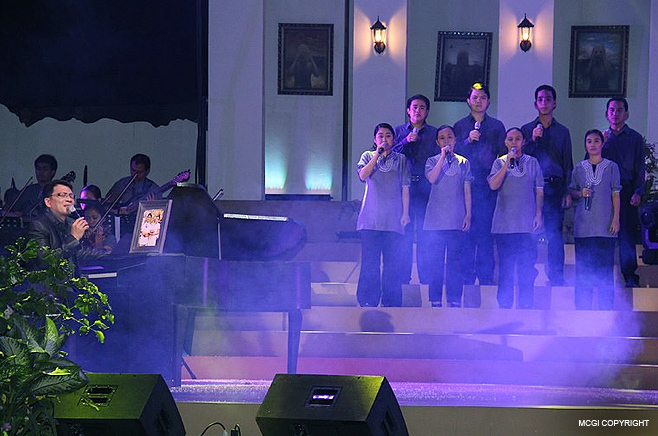 Along with the concert is the launching of its album version, “Songs From My Heart The Album,” released by Able Music International. Incidentally, the sales of the album in its launching day reached an estimate of 20,000 copies. On the very night of the concert, the album was awarded with certified platinum record. The award is certified by Able Music and Philippine Association of the Record Industry (PARI). The award was given by Mr. Bernie Refuerso, Artist and Repertoire Manager of Able Music. Bro. Eli covered and revived some of the greatest classical hits in the album. Among these are Blue Moon popularized by Nat King Cole, My Foolish Heart by Victor Young and Ned Washington, Maalala Mo Kaya version of Dulce, Smile by Michael Jackson, Where Is Your Heart written by George Auric. To complete the 8 tracks in the album, Bro. Eli covers the Philippine’s folk songs, “Atin Cu Pung Singsing” and “Ti Aya’t Ti Maisa Nga Ubeng”. Kuya Daniel Razon performs during the “Songs from my Heart” concert to raise funds for the tuition-free education project. Bro. Eli was joined by Asia’s Queen of Songs, Ms. Pilita Corales; famous balladeers, Anthony Castello and Marco Sison; and popular acoustic singer, Juris in this list. Bro. 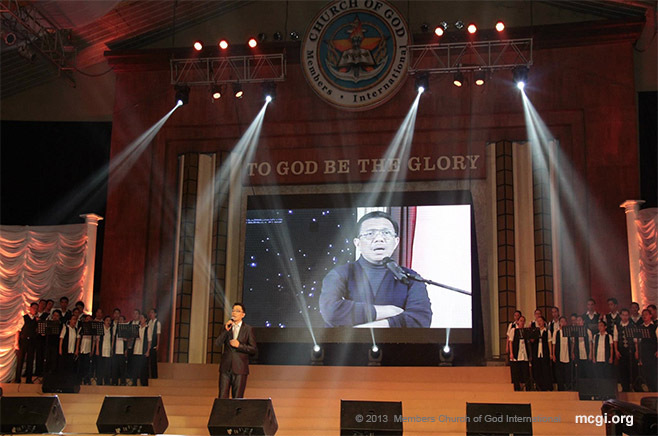 Daniel Razon, the Vice-Presiding Minister to the Members Church of God International who is the main advocate of many public service commitments through UNTV, also performed during the concert. Supporting the concert-for-a-cause are people who share the same advocacy as Bro. Eli, such as members of Church of God International and personalities who believe in the virtue of doing good for others. Bro. Eli has been hosting the religious program, Ang Dating Daan, for 30 years now and is being broadcast in different countries. In English-speaking nations, it is known as “The Old Path”. The international program is highly in-demand among foreign audiences, especially by those who have discovered his preaching via the Internet through theoldpath.tv, truthcaster.com, and by the avid readers of his 2009-Mashable-winner blog, esoriano.wordpress.com.